Our text is Jeremiah 32:20, "God has set signs and wonders in the land of Egypt, even unto this day, and in Israel, and among other men; and have made Yourself a Name, as at this day." The Bible is the story of God changing His Form from the eternal Holy Spirit alone with His thoughts to the manifestation of those thoughts in the glorified flesh of His family. It is fitting that we see this represented in the Great Pyramid. Its missing capstone represents the rejected Christ and His rejected end-time Bride who will be under pre-eminence as He was, to manifest the Sons of God. Its open coffer signifies He is risen, and the various passageways and chambers explain the story able minds of mathematicians and intellectuals have sought for centuries to understand. The word "god" means "object of worship" and Jesus told us that to be pleasing and acceptable to God, we must worship Him in spirit and in Truth. That is, whole heartedly by revelation, having the mind that was in Christ in us. For true worship isn't singing and shouting "Hallelujah's," but having the Token Life of Christ on display all the time. Our lives are to be written epistles of the PRESENT Truth, read and known by all men. So we can only worship or serve God as we understand His Word. And He made a way. As a result of Eve's deception and swift redemption by Adam, the human race separated themselves from God's Presence. But He made a way back through the shed blood of an innocent Kinsman as revealed in the symbolism of the Garden after the fall with four cherubim guarding the Altar in the East. Also in the heavenly Temple from which Moses patterned the Tabernacle in the Wilderness and Solomon built the Temple. These motifs are repeated throughout the Book of Revelation, in our new birth, and the three kinds of believers. Picturing the Temple in our minds we see the place of the Presence or Holy of Holies in the West. East of the vail in the Sanctuary stood the Altar of Incense, to the North was the Shewbread, and on the Southern side stood the seven Lamps of Fire representing seven portions of the Spirit that anointed the seven stars or Church Age Messengers to Illumine the Message of Life to the saints of their day. Eastward and surrounding the Sanctuary the people worshipped. Now Brother Branham's ministry was two-fold. His Message was first to restore the apostolic faith (Malachi 4:5-6), then to introduce the second Coming of the Fullness of the Word -- Christ's parousia (Acts 3:23; I Corinthians 13:19; Revelation 10:7). In the visions and dreams Brother Branham recounts in Messages like Sirs, Is This The Time, The Seven Seals, This Day This Scripture is Fulfilled, What is the Attraction on the Mountain, and And Knoweth It Not, we view the Southern side of the pyramid extending East and West with the capstone representing the Fullness of the Word. The seven heavenly anointings make up the fullness of the Spirit when the Word of the star Messaengers is aligned in a constellation they form a conjunction or pyramid of Light from three lamps East, and three West of one central lamp on the seven-branched Golden Lampstand. In restoring the revealed Word Brother Branham retraced the Gospel Light from the East through the Seven Church Ages to the Presence in the West. Here he met with seven portions of the Spirit shortly before their work of quickening part-Word was completed at the end of the Laodicean Church Age, and they left this earth as we read in Revelation 4:5. "And out of the throne proceeded lightnings and thunderings and voices: and there were seven lamps of fire burning before the throne, which are the seven Spirits of God." Visualizing the sanctuary with its Golden Lampstand in the South you will see why he had to go West for the evening-time Light of that last Angel who would unite with the other seven portions of the Spirit to form the Fullness of the Spirit that would anoint him as he ministered, to introduce the Fullness of the Word: Christ. Not the Man, but the Spoken Word of his Message (I Corinthians 13:10). That's why he could so readily identify with that seventh angel. He returned East from Tucson to Jeffersonville where he was inspired to preach the Seven Seals to his people as successive anointings of the Spirit came upon him in a seven-fold manner. A partial anointing of the Spirit was not sufficient to quicken the Fullness of the Word which is why the Church Age saints could only speculate on the meaning of the Seals. If you are familiar with the visions you'll understand how the mystery was within the constellation of the angels, and was the seven-fold voice of God that John was forbidden to write (Revelation 10:1-4). In another vision, Brother Branham was interpreting writing on the sides of a pyramid mountain that represented the Church Age saints written by the washing of water by the Word, or faith. It showed him go Westward and open the top of the pyramid to reveal a white granite stone with no writing, emblematic of the Seven Thunders or unwritten Word God would declare through the mouth of His Prophet. He said, "I stood there a little bit till the Holy Spirit revealed it. I said, "The entire Bible, as much as has been revealed to men through justification, sanctification, the baptism of the Holy Ghost, the baptism in Jesus' Name, and all these things has been revealed, but there is secrets that's hid inside, because the Bible's sealed with Seven Seals. I must go there to find it." "Here we are today, we're understanding serpent's seed; in a few days, if God willing, we'll understand the correctness of marriage and divorce and all these things that God's opened, every Seal, the mysteries, since the foundation of the world, and we've been enjoying the Presence of His blessings" (This Day This Scripture is Fulfilled, 21:172-180). In the Seals he said, "If you're listening to the tape of "What Time Is It, Sir?" you'll notice that one Angel was very notable to me. The rest of them just seemed ordinarily; but this Angel was a noted Angel. He was to my left in the constellation in a form of a pyramid. And you remember, it was in the pyramid where the mysterious white rock was not written on. And the Angels took me into that pyramid of themselves, the mysteries of God known only to them. And now, they were the messengers that came to interpret that pyramid or that message of the secret of these Seven Seals which lays with inside the pyramid." (That is, the unwritten Word uttered by the Voices of the Seven Thunders). "Now, the Angel was to my left, would really be the last, or seventh Angel, if we would count them from left to right, because he was on my left, me looking to him towards the west, him coming towards the east would be on the left side, so that would be the last angel's message: very notable. You remember how I said he had kind of his head back, and his great sharp wings, and how he flew right to me. Now, that is this Seventh Seal. It's still is a notable thing. We don't know what it is as yet, because it's not permitted to be broken" (Seals, 578:1-2). The understanding didn't break to his followers until about twelve years after Brother Branham's death as he'd predicted in his 1977 statements. By that time the Bride began to realize she was not a part of Laodicea and started to separate from the Pentecostals and their Message. She began to see that her Messenger was not William Branham who was the angel to the Seventh Church Age. Her Messenger was Christ Himself (Revelation 10:8-11). Sadly, the Book is still sealed to most people in Message circles. They haven't the faintest notion what It's all about. And like the disciples of John the Baptist encountered by Paul at Ephesus, these good people are following the Prophetic forerunner and often rejecting the Word He introduced. The Great Pyramid was constructed of granite overlaid with 144,000 white limestone slabs cut to optical precision. The joints are consistently one fiftieth of an inch, that's about as thick as five pages of your Bible, but the cement was probably used as a lubricant to slide the blocks into position. None of these highly polished stones weigh less than a ton.Typing the Church of All Ages, Brother Branham said, "It's got to be honed. In that pyramid, you can take a razor blade, and you can't run between them rocks where the mortar was; it's so fitly put together" (Spoken Word Original Seed Jeff 62-0318E). We must be Word upon Word, line upon line, each dispensation blending into the next. Long ago the beautiful protective stones were carried away like the 144,000 Israelites, who'll be the Bride's guardian servants, were dispersed. But Matthew 24:31 says, "He shall send his angels (the two witnesses of Zechariah 4 and Revelation 11) with a great sound of a Trumpet, (the Seventh Trump of I Corinthians 15:52 and I Thessalonians 4:16) and they shall gather together his elect from the four winds, from one end of heaven to the other." Revelation 7:4, "I heard the number of them which were sealed: and there were sealed an hundred and forty four thousand of all the tribes of the children of Israel." and had TWELVE GATES, and at the gates twelve angels, and names written thereon, which are the names of the TWELVE TRIBES of the children of Israel: On the east three gates; on the north three gates; on the south three gates; and on the west three gates. . . And he that talked with me had a golden reed to measure the city, and the gates thereof, and the wall thereof. And the city lies foursquare, and the length is as large as the breadth: and he measured the city with the reed, twelve thousand furlongs. The length and the breadth and the height of it are equal. And he measured the wall thereof, 144,000 cubits, according to the measure of a man, that is, of the angel." According to Dr Joseph Seiss, "It has been ascertained and clearly demonstrated that there is in the measures, pointings, form, and features of that great primeval monument . . . a massive and indestructible stone memorial of a complete and faultless knowledge of the structure of the universe, of the exact and physical sciences both terrestrial and cosmical, a determination of a perfect system of weights and measures scientifically conformed to what the Opifex Mundi (Creator of the World) fixed in things when he fetched a compass round the worlds and weighed the hills in balances. Scientific investigation on the part of different men competent to the task have made it clear that there is built into that edifice a record of the heavens at the time of its erection which gives its age by astronomy in full accord with all external indications and evidences; also a record of the size, form and weight of the earth and its relation to and distance from the sun, the true length of the solar year, the number of years in the precessional cycle, the average temperature of the habitable world, together with the multitudinous cosmical facts and mathematical formulas and proportions no better told by sciences now existing among men" (Joseph Seiss, Gospel in the Stars, 175). I believe they had a more sophisticated understanding of atomic theory that we have today, and by changing polarity were able to levitate matter sufficient to eliminate friction so men or animals could guide perfect masonry to the top of the structure via ramps. There one man might levitate and accurately position their immense mass and weight according to the plans. I once saw a film about Edward Leedskalnin, an immigrant American, who, unaided, built Coral Castle in Miami, Florida. He quarried, shaped and erected 1,100 tonnes of coral over 28 years. The average weight of each block was 6 tonnes, (almost three times the average weight of the stones used in the Great Pyramid), and the largest stone in the Castle weighed 30 tonnes. His only mechanical aid was a small lewis that would not support one ton. Altogether there are 80 pyramids in Egypt, 100 in the Sudan, still more in China, South America, and even Australia. The most famous in Egypt are the step, "bent" and Great Pyramids. It is commonly held that these pyramids illustrate an evolution in engineering sophistication. Scientific knowledge encoded in the Great Pyramid has only begun to be fully understood in the past two centuries. I rather suspect they illustrate a degradation of engineering skills from the time of the construction of the Great Pyramid to the more recent pyramids. Before the Eiffel Tower, the Great Pyramid was the world's tallest building. It stands 481 feet and its masonry is twice the volume and thirty times the mass of the Empire State Building. It covers 13 acres, an area large enough to hold the cathedrals of Florence, Milan and St. Peters, as well as St. Pauls and Westminster Abbey. It measures 756 feet along each side at the base and is estimated to have contained 2,300,000 blocks of stone. The largest measure 30 feet in length, and weighed 880 tons. All of its stones laid end to end would stretch two-thirds of the way around the equator. While being the oldest structure, the Great Pyramid is the most accurately oriented, its sides being aligned true North, South, East and West with such accuracy navigators can swung a compass. The Great Pyramid is only three minutes deviant, and Raymond Capt claims this is due mainly to subsidence. Modern man's best effort, the Paris Observatory, is six minutes off true north. Architects and engineers who have studied the Pyramid's structure contend we could not build this structure today, indicating man is in a state of entropy. Joseph Seiss and others have demonstrated that the Pyramid lies in the center of gravity of the continents, dividing earth's land mass into approximately equal quarters. The north-south axis (31 degrees East of Greenwich) is the longest land meridian, and the east-west axis (30 degrees North) is the longest land parallel on the globe. The only place where these lines of the terrestrial earth can intersect, is at the Great Pyramid. Its possessed an advanced knowledge of geography, knew the size, shape and position of all the continents and were accustomed to thinking on a global scale. The "pyramid is so geographically set in the center of the earth, till there's never a shadow around it, no matter where the sun is" (Perseverant 62-0729). 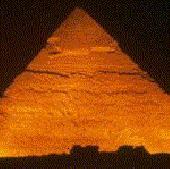 Of course at sunset the Great Pyramid does cast a shadow, but not on its own sides which are slightly convex. Each side represents a segment of the Northern Hemisphere, or a quadrant of 90 degrees. Its apex corresponds to the North Pole, and its perimeter to the equator in perfect scale. Isaiah 19:19-20 says,"In THAT DAY there will be an ALTAR to the LORD in the MIDST of the land of Egypt, and a PILLAR at the BORDER thereof to the LORD. And IT shall be a SIGN and a WITNESS to the LORD of hosts in the land of Egypt: for they shall cry to the LORD because of the oppressors, and He shall send them a Savior, and a Great One and He shall deliver them." The Pyramid is certainly a "pillar" as the text requires, and also an "altar" in the sense of being a witness to the Lord. Joshua 22:26-27 "Let us now prepare to build us an ALTAR, not for burnt offering, nor for sacrifice: But that it may be a WITNESS between us, and you, and our generations after us. . ."
The gematria of Isaiah 19:19-20: also identifies the Great Pyramid as God's special revelation. Gematria is the science of finding meaning in the numerical value of words and was used by Ivan Panin and others to demonstrate the Supernatural inspiration of Holy writ. Having no numerals, the Hebrews designated the letters of their alphabet with a numerical value. Thus every word has the numerical value of the sum of the value of its letters. The sum of the value of all Hebrew characters in the these verses is 5449, the height in inches of the Great Pyramid! Those of you who are familiar with the Questions and Answers on the Seals will recall the Holy Spirit stopping Brother Branham and correcting him on one of his answers. These are the New Testament saints God saw from the foundation of the world rejoicing in the revelation that placed them into the Body of Christ (Seals 501:4). Adam was indued with innate science which was passed down to Seth, preserved in the Pyramid by Enoch and rekindled on this side of the Flood. This explains how Egypt sprung forth spontaneously as a sophisticated civilization. After the Fall, God made known to Adam His purposes concerning the Serpent and its seed, and the woman and her Seed -- the Gospel and the mystery of redemption. Nothing of the New Testament is "new". It was all written in the Stars from the beginning of time and revealed to God's holy prophets since the world began. Man is in a state of entropy from the superior being he was created, to the perversion Satan has been developing since the Fall. Our prophetic forefathers were not primitive apemen. They knew and loved God. They wrote books recording the prophecies and wisdom revealed to them and explained the Gospel in the Stars aeons ago. Acts 3:17-23, "Brethren, I know that through ignorance you killed Messiah, as did also your rulers. But those things, which God before had shown by the mouth of all His prophets -- that Christ should suffer -- He has so fulfilled. So repent, and be converted, that your sins may be blotted out, when the times of refreshing (the new birth) shall come from the Presence of the Lord; And He shall send Jesus Christ, who before was preached unto you: Whom the heaven must receive until the times of restitution of all things, which God has spoken by the mouth of all His holy prophets since the world began." God has had prophets since the beginning of the world, and all the prophetic revelation from Adam must be restored before Christ's parousia. This means one final prophetic ministry to the Gentiles because the Word of God comes only to a prophet and this man would restore "all things, which God has spoken by the mouth of all His holy prophets since the world began." That's the Fullness of the Word which IS Christ. And that was His second or "parousia" Coming through the mouth of the late William Branham in WORD Form. "For Moses truly said unto the fathers, 'A prophet shall the Lord your God raise up unto you of your brethren, like unto Me; him shall you hear in all things whatsoever He shall say unto you. And it shall come to pass, that every soul, which will not hear that prophet, shall be destroyed from among the people'." Of that forerunner, Jesus said, "Elijah truly shall first come and restore all things spoken by the mouth of all God's holy prophets since the world began" (Matthew 17:11). That's why, when Jesus opened the Seventh Seal, "There was silence in heaven." The Fullness of the Word had already gone forth by the mouth of all God's Holy Prophets since the world began. Not one Word could be added to or taken from that which is already perfect. Praise God! Those who fail to receive the Message will fail to receive Christ. Those who add to the Message will be cast into the tribulation and those who reject and take from It commit the unpardonable sin and will be cast into the Lake of Fire. Outside the Message of this hour there is no possibility of becoming a Christian. No way! Jude 14-15, "And Enoch also, the seventh from Adam, prophesied of these, saying, 'Behold, the Lord comes with ten thousands of His saints, To execute judgment upon all, and to convince all that are ungodly among them of all their ungodly deeds which they have ungodly committed, and of all their hard speeches which ungodly sinners have spoken against Him'." And in our day the mystery of God is finished. In other words, His plan of redemption is fulfilled in the restoration of the Fullness of the Word which is the return of God's Presence in Word Form. That's right, we're on our way back to the garden of Eden. Very soon that Presence will be manifested in the glorified flesh of His saints. Then we will change and be caught up with them to meet our glorified Lord in the Air. Sanchoniathon and other ancient historians inform us that the seven vowels in the earliest alphabet were "so arranged as to express the places of the seven visible planets in the Zodiac" at the time when the alphabet was completed. The twenty-five letters and the twelve zodiac signs were superimposed, with the vowels unevenly spaced to represent the planetary positions at that time. Thus the alphabet records "an exact notation of the actual condition of the heavens at an ascertainable date, which can occur but once in many thousands of years, and that date is the seventh of September, 3447BC" (Joseph Seiss, Gospel in the Stars p.23, 174). Even if he is out by a day or two, a finished astronomical science as well as writing were already completely developed in Adam's lifetime and these astronomical facts and chronologies were preserved in the Great Pyramid. Since Mary's conception by the Word of the Angel, when Earth was in Virgo, the first sign of the zodiac, Earth's position in space has moved about 30 degrees, or one full sign so that Leo, the last sign in the zodiac will take Virgo's position when the Zodiac has traveled its full cycle. This prophecy is recorded in the Sphinx that stands before the Great Pyramid in which the Body of the Lion of the Tribe of Judah, the Church, is united with the Head of the Virgin, in the catching-away of the Church. The Word sphinx derives from the Greek "sphiggo" which means "to bind closely together" and signifies to Christians the circle began with the Christ's conception by the eternal Word and it ends by taking the Offspring of that Word back into eternity with Him. The Great Pyramid represents the Earth that now is. It is a perfect prophecy in stone so its Passageways are aligned with heavens which are now. This is why those who try to unlock its mysteries by measurements calculated from Earth's present relationship with the heavens cannot hope to obtain correct answers as the pre-Flood year was one of only 360 days. When earth had its water baptism, the Flood only washed away past sin. Sinful Ham was in the ark with the remnant, so as man entered the post-diluvian world symbolized by the pyramid he was under the Dragon star, sign and dominion of Satan, on the Descending Passage and bound for the Pit. However, about a quarter of the distance down the Descending Passage we encounter an Ascending Passage, indicating a separation from sin and representing God's dealings with Israel in the Exodus and under the Law until Calvary. The elevation of this narrow upward passageway is 26 degrees 18' 9.7". The ceiling is so low one must stoop, indicating the Law was based upon works of obedience that no man could satisfy. The Grand Gallery continues upward at the same angle, representing Pentecost and the Seven Church Ages. Its corbeled walls formed by seven successive overhanging courses of masonry at an elevation of 26 degrees 18' 9.7" so although the way is strait and narrow, it is no longer necessary to stoop. This is a picture of the Grand Gallery looking back down towards the ascending passage from the Great Step at the top of the climb. Soon after the commencement of the Grand Gallery, we encounter the mouth of an open well. The Well Shaft follows a serpentine passage to the Pit or prison house of the lost, opening part way down into an empty cavern that may represent the dimension called Paradise where the Old Testament saints awaited their Kinsman. From the mouth of the Well Shaft, a horizontal passageway leads to the Queen's Chamber which may represent the dimension wherein the Israelite "souls under the (Sacrifice) Altar" and other groups of the "saved" -- those remaining on the Book of Life being justified and sanctified but not filled with the Spirit. These await the general resurrection when they will appeal at the White Throne Judgment. The position of the Queen's Chamber almost directly under the Ante Chamber to the King's Room further identifies it with the "saved" when we extend a time line downwards, for when the Seventh Trumpet sounds, the elect enter the King's Chamber and salvation ends. Daniel 7:11-12, "I beheld then because of the voice of the great Words which the horn (Rome) spoke: I beheld even till the beast (or Devil-incarnate Pope) was slain, and his body destroyed, and given to the burning flame. As concerning the rest of the beasts, they had their dominion taken away: yet their lives were prolonged for a season and time." (Till after the Millennium when they would be resurrected and judged in the bodies in which they had sinned). The Grand Gallery terminates at a Great Step beyond which, a level floor under a low passageway takes one to the Ante Chamber of the King's Chamber. Known as "Enoch's circle," the Ante Chamber is 10 feet long by 42 inches wide, by 12 feet high. Here we met the Prophet of Malachi 4:5-6 and Revelation 10:7 who stood in the gap or breach and introduced us to the King (God's Only Provided Place of Worship, 33:217). Just before the passageway to the King's Chamber two granite beams cross the chamber, suspended just below the ceiling, one above the other, 52 inches above the floor. The upper block appears to be broken-off from above and is marked with a half circle that may be a lifting boss or symbol similar to the Egyptian hieroglyph for a loaf of bread which might speak of the second wave offering of the Bride beyond that point but prior to our translation. A circle signifies eternity. Here we are in transition back to Eternity by the three-fold process of the Shout, Voice and Trump of I Thessalonians 4:16. Enoch's circle measures 365.25 inches. Genesis 5:23, "All the days of Enoch were three hundred sixty-five years." Enoch was translated when he was 365 years old. The passage into the King's Chamber is only 42 inches square. The revelation of the Seven Seals was the commencement of the end time (Daniel 12:4, 9; Revelation 10:4, 7). Within the Ante Chamber, just before the entrance to the King's Chamber the wall contains grooves for a portcullis whose granite door was lowered to seal the Chamber. Jesus said, "While the foolish virgin went to buy, the Bridegroom came; and they that were ready went in with Him to the Marriage; and the door was shut" (Matthew 25:10). As it was in the days of Noah, the door to the King's Chamber, like the door to the ark, will be shut by God from Above (Genesis 7:16). Brother Branham said, "did you know that men who are sons of God are amateur gods? How many ever knew that? How many knows that Jesus said so? The Bible, Jesus said, "Did not your Law say itself that you are gods? And if you call them gods..." Which, God said in Genesis 2 that they were gods, because they had full domain over the dominion of the world. He gave him dominion over all things. And he lost his godship; he lost his sonship; he lost his domain; and Satan took it over. But, brother, we are waiting for the manifestations of the sons of God, who'll come back and take it over again. Waiting for the fullness of time, when the pyramid gets up to the top, when the full sons of God will be manifested, when the power of God will walk out, (Hallelujah! ), and will take every power that Satan's got away from him" (Adoption 114:76). The floor from the Great Step to the King's Chamber is the same polished red granite from which the King's Chamber is constructed indicating we are walking in way of the Lord. We're at the top of the pyramid now, coming to maturity, and waiting for the earthquake to call the resurrection of the sleeping saints and the manifestation of the Sons of God. We're in the Ante-Chamber waiting on the King. He's just a little higher in another Dimension. The King's Chamber is situated on the fiftieth level of masonry. Fifty speaks of the Pentecostal Jubilee of returning to the unity of the apostolic faith for the manifestation of the Sons of God and the translation. Those in the denominational walled cities can not come out in the Jubilee. They stayed in Laodicea beneath the Great Step (Feast of Trumpets, 14:106; Future Home, 44:371-383). 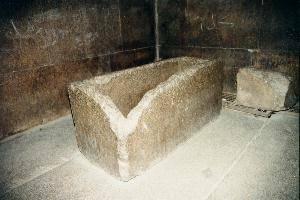 Interestingly, the dimensions of the Holy of Holies match those of the King's Chamber whilst the interior capacity of the Coffer matches that of the Ark of the Covenant, indicating there are only so-many saints foreknown. The Great Pyramid, like the tabernacle and the temple was a instructive symbol patterned after the same heavenly vision. When the Seventh Trumpet sounded, "The temple of God in heaven was opened and there was seen in His Temple the Ark (or coffer) of His Testament. . ," signifying God's Presence with Israel, the Lord Jesus Christ revealed when the vail is torn from their eyes as it was rent in the Temple. Alluding to the Great Pyramid as a type of the Body of Christ, Brother Branham said, "Father God, I pray that today, as the door's still open, the people are coming from the east and west, north and south, gathering in. Great signs are happening . . . O God, we're near the end." "And the Great Pyramid that Enoch built, the last chamber's gone through, ready for the King's chamber now, the Coming of the Lord right in the top for the keystone. All the calendar of astronomy points right straight; the stars are declaring it, as they did at the first time. When the wise men looked up and saw the stars, they said, "There, the great King's coming." Now, the stars are pointing again" (The Ark, 22:172-173). Brother Branham said, "God wrote in the pyramids. If you study them, watch the ancient histories and wars, how they were built before the antediluvian destruction" (Adoption 104:22). The Greek word for "stature" indicates a measure of time, not a measure of length. Jesus was not giving the formula on how to make NBF stars. I believe we have measured time in this study of the Great Pyramid -- but dispensations rather than dates. I'll stand on the things God has revealed from His third Bible, I don't wish to mix natural, scientific wisdom in the Pyramid with Supernatural application of the prophetic Word. God conceived of the pyramid to preserve the natural wisdom of the ancients safely through the Flood and used it also to signify His incarnation in the glorified form of His saints. Satan has taken and perverted this symbol to represent his dominion over a kingdom of this earth which he usurped from God and man at the Fall. Franklin gave his approval to the Phoenix, saying that a wild turkey had good character and was a fowl with a marked aversion to the color red. He was bitterly disappointed when told the bird was intended to represent an eagle. He remarked that an eagle was a bird of prey and lacked the respectable qualities of the wild turkey. E. Raymond Capt, The Great Pyramid Decoded; Thousand Oaks, CA: Artisan Sales, (1978). Legrand H. Clegg II, Egypt During the Golden Age, When Black Men Ruled the World, Compton. Davidson, The Great Pyramid, Its Divine Message (1925). William Fix, Pyramid Odyssey, Urbanna, Virginia: Mercury Media, Inc., (1984). A. Ralph Epperson, The New World Order (1990). Evans, The Mystery of the Pyramids (1979). Jonathan Gray, Sting of the Scorpion (1996). John Greaves, Pyramidographia, cited in Serpent In The Sky, Harper & Row, New York, (1979). Manly Palmer Hall, The Secret Destiny of America (1958). Clarence Larkin, Dispensational Truth, (1918). Lockyer, The Dawn of Astronomy (1894). Mendelssohn, The Riddle of the Pyramids (1974). Petrie, The Pyramids and Temples of Gizeh (1883). Smith, Our Inheritance in the Great Pyramid (1874). Joseph A. Seiss, A Miracle in Stone (1877); Gospel in the Stars. Skinner, Key to the Hebrew-Egyptian Mystery in the Source of Measures (1875). Taylor, The Great Pyramid: Why Was it Built and Who Built it? (1859). Tompkins, Secrets of the Great Pyramid (1971). Barbara G. Walker, The Women's Encyclopedia of Myths and Secrets (1996). Colin Wilson, From Atlantis To The Sphinx.